Hell has moved, and now has set up shop down under. Australia is going through ANOTHER heat wave, breaking all past records, and basically making everyone there miserable. The past four months have been the hottest ever recorded on the continent. 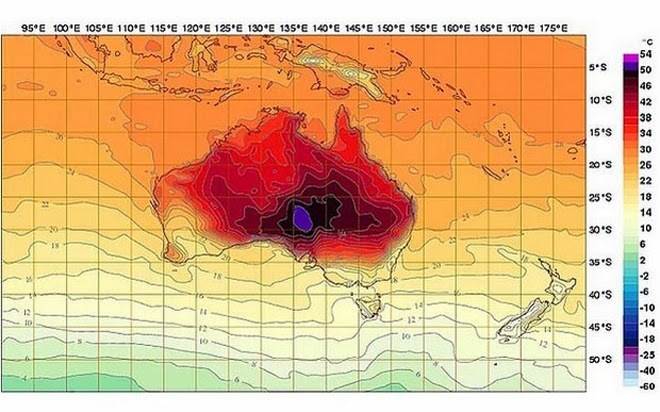 Australia has been sweating through a major heat wave to start the year. Heat records fell across a large part of the country in the first week of the New Year. The warm weather is currently centered over sparsely populated Western Australia, but it could hit major population centers along the east coast by late next week. The Australian Bureau of Meteorology released a statement. The statement said the heat wave has been, “highly significant with substantial areas having their hottest day on record.” The heat wave comes on the heels of Australia’s hottest year on record during which a slew of records were shattered, including the country's hottest summer.